As you should know by now: 7 days aren’t enough to see all the beauties of Vietnam and many travelers find it to be a difficult job choosing which destinations to visit in just one week in Vietnam. The country needs no introduction beside one fact: the UNESCO protected world heritages of both nature and culture dotting from north to south, boasting such depth of the land with a history of thousands of years. To help you sort out the best 7-day itinerary for your trip to Vietnam, we’ve listed here our 5 best plans meticulously designed for one week in order for you to enjoy the most of Vietnam. See the very essential Vietnam in 7 days! In just 7 days, you'll see all the essential attractions of Vietnam, necessarily to understand about Vietnam as a country. From Hanoi with is fading colonial architecture to the breathtaking landscapes of Halong Bay, from the vintage Hoi An to historical yet modern Ho Chi Minh City, wonder after wonder await your discovery. 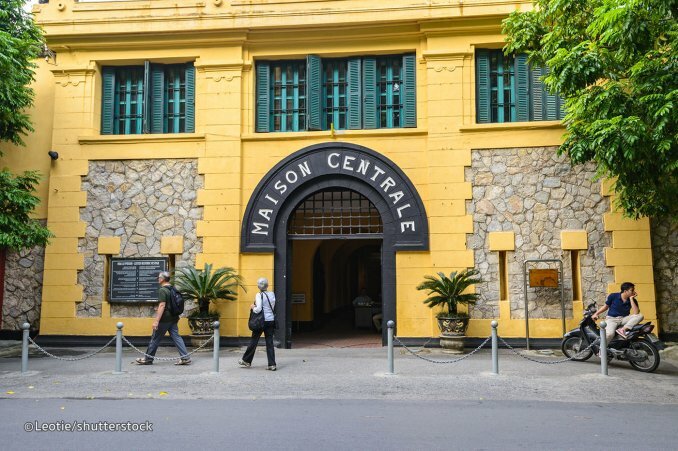 After arriving at Hanoi, since you're still tired from the flight and drive, an electric tram tour or cyclo tour through the Hanoi’s Old Quarter should be a wonderful thing to do in your first day in Vietnam. The famous 36 streets once selling Hanoi very own handicraft products. 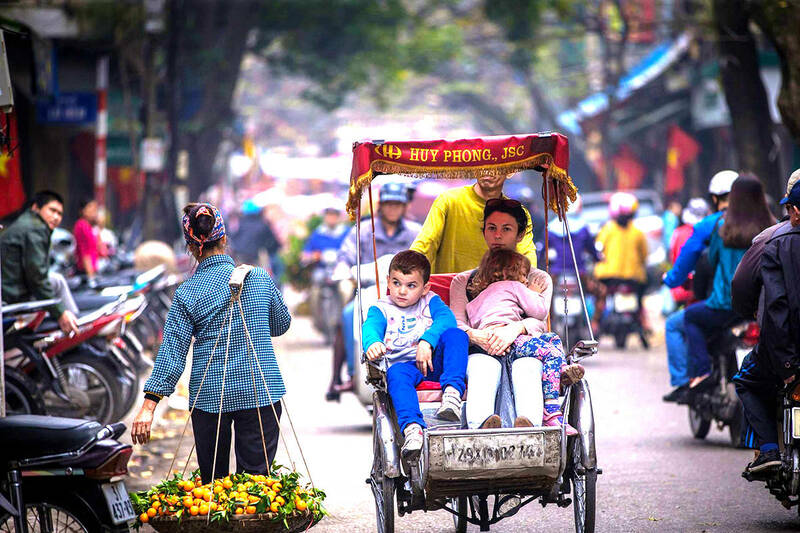 In modern time, Hanoi Old Quarter has become the most central quarter of Vietnam’s capital where visitors can enjoy Vietnam culture, traditional architecture and cuisine presented in such modern way. 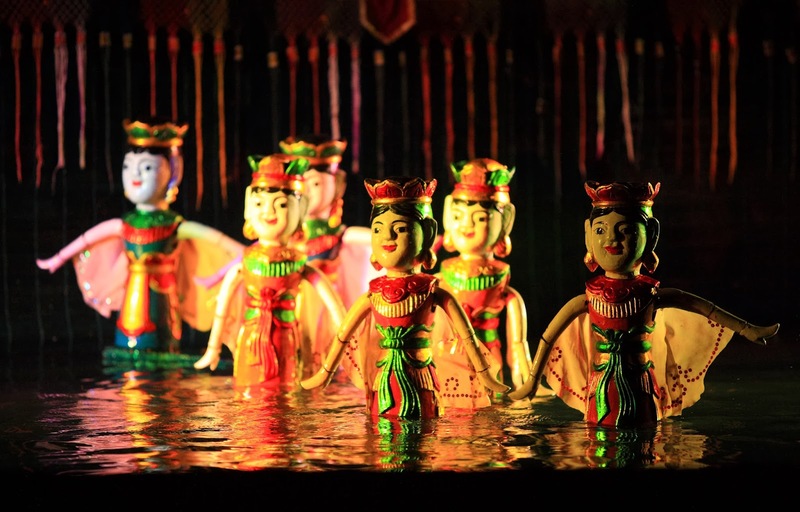 Enjoy a performance of water puppetry – a Vietnamese folklore art form that has seized the love of people from across the world. Take a half-day city tour to see more of Hanoi. Most Hanoi city tours will take you to highlighted Hanoi attractions such as Ba Dinh Square to see Ho Chi Minh’s Mausoleum, Hanoi’s iconic One-Pillar Pagoda, and Temple of Literature. 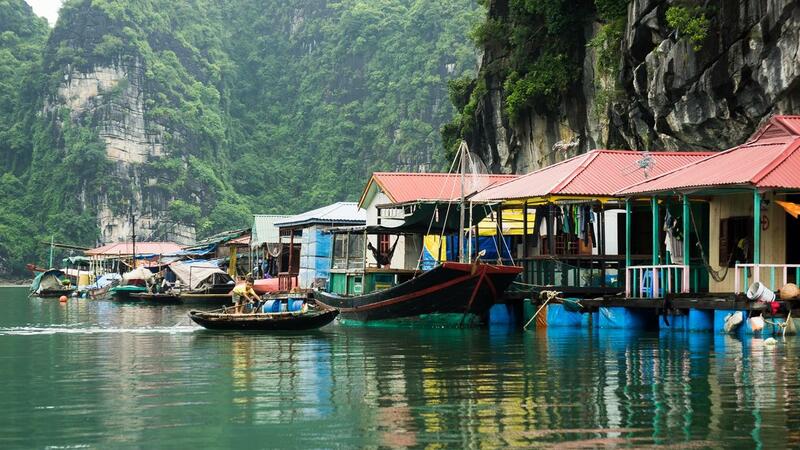 In the afternoon, get to Halong City and stay overnight in the city before getting to world’s wonder Halong Bay. Get on our private cruise to get lost in middle of Halong Bay’s limestone islands and islets, formed in thousands of shapes and size by Mother Nature. 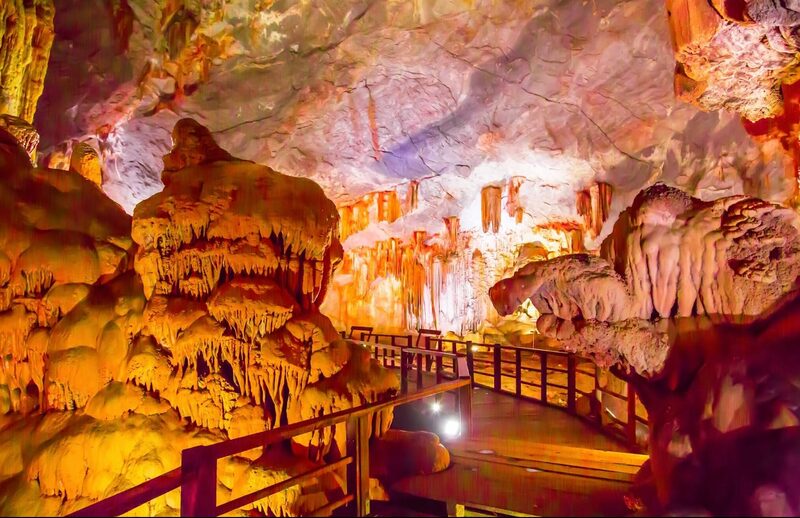 Not only you’ll have a chance to enjoy one of the world’s most impressive landscapes but also visit the beautiful Thien Cung Cave – a truly heaven palace on earth. Return to Hanoi to take a short flight to Da Nang. Stay the night at this beautiful and modern city. You can enjoy Da Nang nightlife - sparkling bridges, modern ambiance and bustling street food scene. 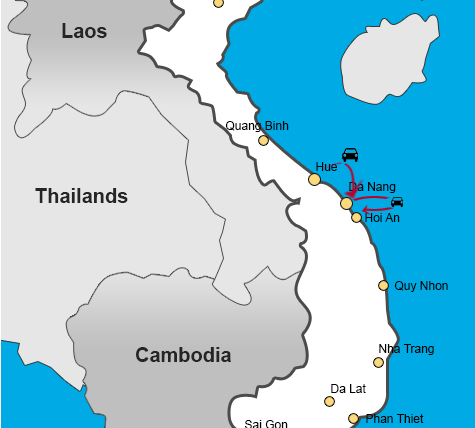 Drive to Hoi An, which is just half an hour away from Da Nang. You can spend this day to take a walking tour to see the world’s cultural heritage Hoi An Ancient Town – once an international trading port in Asia during 15th-19th centuries, well-preserved until this day. 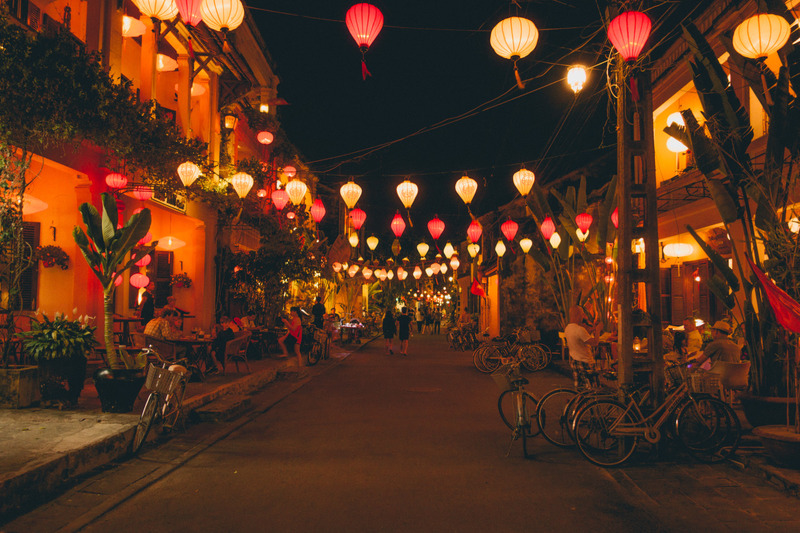 The ancient houses in Hoi An are lit with colorful lanterns, only adorning even more its prominent Chinese architecture. We can’t miss the chance to visit and take a look at Japanese Covered Bridge – a landmark that has so many values in architecture and history. The 200-year-old Phung Hung Ancient house is also a site worthy of your visit with its unique style. Arrive late and stay overnight in Hue. Hue is another world’s heritage site of Vietnam, preserving such quintessence of traditional royal Vietnamese architecture. The Forbidden Purple City of Hue’s imperial citadel was built based on the Chinese’s famous Forbidden City in Beijing. The palace retains a feeling of its past scale and importance, with detailed stonework and pavilions and it is at the moment in the process of being restored to its former magnificence. A boat ride on Perfume River, stopping at Thien Mu Pagoda is a must. 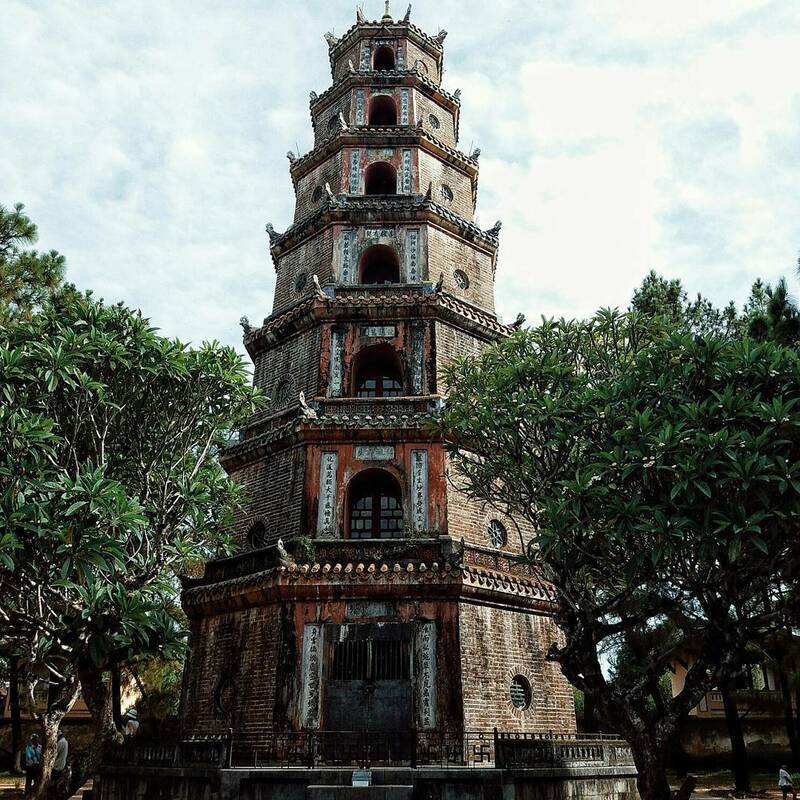 Thien Mu pagoda is the most famous religious site in Hue for its iconic 7-tier chedi. From Thien Mu, you’ll be enjoying great views over the poetic and beautiful Perfume River, especially during sunset. Once we’re in Hue, we can’t miss visiting the emperors’ tombs in the surrounding of Hue which are acutally resting places of Nguyen emperors, blessed with such a peaceful atmosphere and natural beauties. Depart from Hue to Ho Chi Minh city. 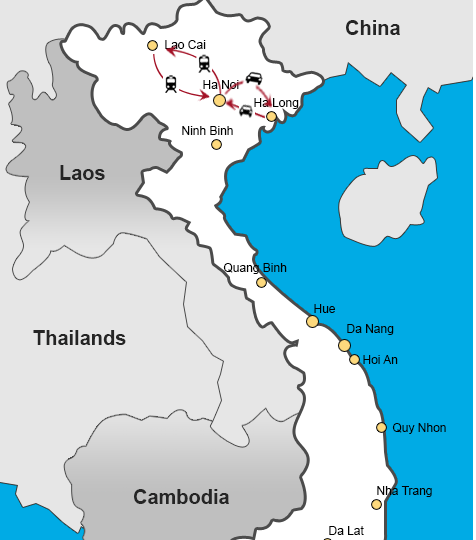 From Ho Chi Minh City, it only take about 1 hour to reach to Cu Chi Tunnels. Here, you'll discover parts of the 151-mile system of underground tunnels, used by the communists during American War to live and shelter from the US bomb raids. The afternoon tour will take you back to explore the largest city of Vietnam. Come to War Remnant Museum, City’s Central Post Office and the symbolic Notre Dame cathedral. Are you planning for a romantic getaway for the honeymoon holiday of your life? Vietnam is a great destination for couples and newlyweds for its beautiful landscapes, culture authenticity, pristine beaches, private luxury resorts and great cuisine. Enjoy all of these things in just 7 days of your romantic journey. Arrive in Hanoi, check in your hotel and start with a cyclo tour to Hanoi Old Quarter. Enjoy the exciting and bustling atmosphere of Hanoi’s 36 Old Streets where tradition meets modernity. A welcome dinner will offer you just the best dishes of Vietnamese cuisine. Get to see Halong Bay in the most magical moment of the day – daybreak, and enjoy a light exercise with a Tai Chi class. Come back to Hanoi to take a short walk to Sword Lake and Ngoc Son Temple. Admire one of the oldest Vietnamese forms of folklore art, originated from northern Vietnam. After landing in Phu Quoc Island or Pearl Island, go on a half-day tour to the north part of the island to visit Ganh Dau Beach and Khu Tuong Pepper plantation. Go on to visit a sparkling farm – Phu Quoc Pearl Farm to see how pearls in Phu Quoc are harvested. Discover Vietnam’s hidden paradise island – Phu Quoc Island. 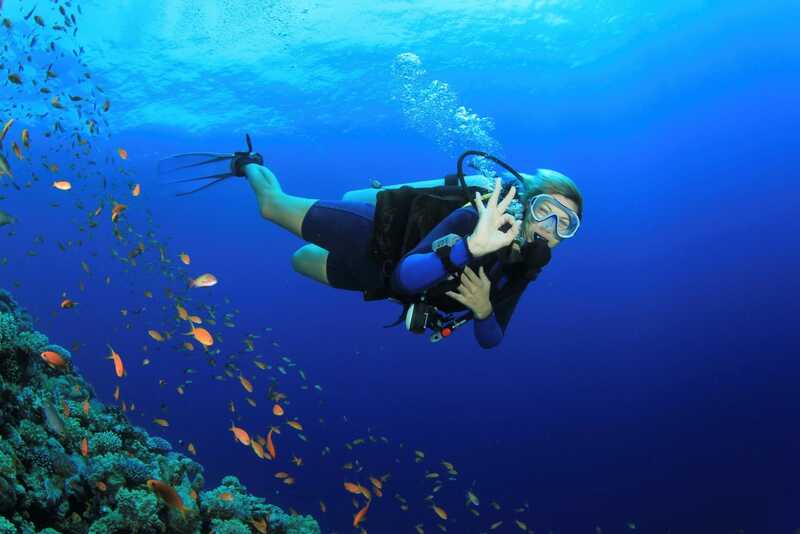 Once you're in Phu Quoc, you should spend a whole day enjoying swimming and sunbathing on the beautiful, pristine beaches of Phu Quoc or choose an optional diving tour to discover undersea worlds. Stay overnight in Phu Quoc. 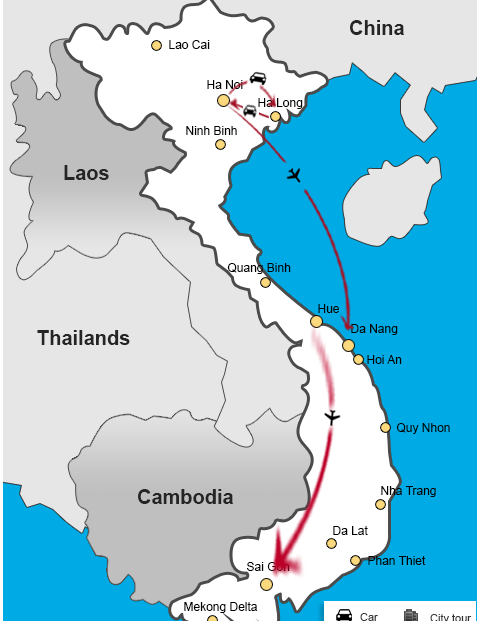 Flight from Phu Quoc to Ho Chi Minh City then transfer to Cu Chi Tunnels to get under the ground and be impressed by the complex of tunnels built by communists during American War to shelter the people and soldiers from US bombs. Get back to HCMC and if you still have time and not too tired, take a a half-day city tour to see Reunification Palace, Central Post Office, Notre Dame Cathedral. In the evening, enjoy a dinner on Saigon River Cruise. 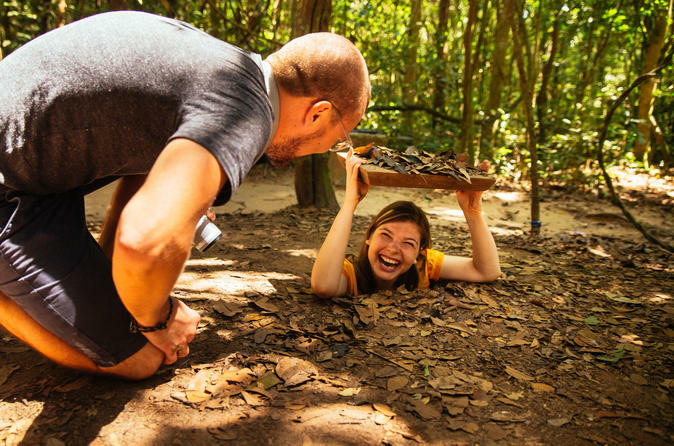 Perfect for travelling with kids & teenagers, Vietnam family holiday offers the perfect combination of adventure and excitement for all the family. 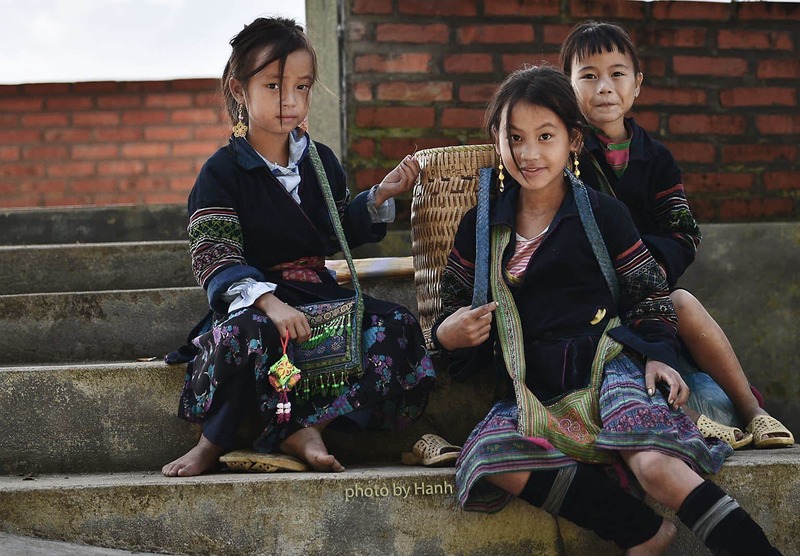 Vietnam has a rich culture and age-old traditions, a trip to Vietnam can be educational and help broaden your kid’s mind. 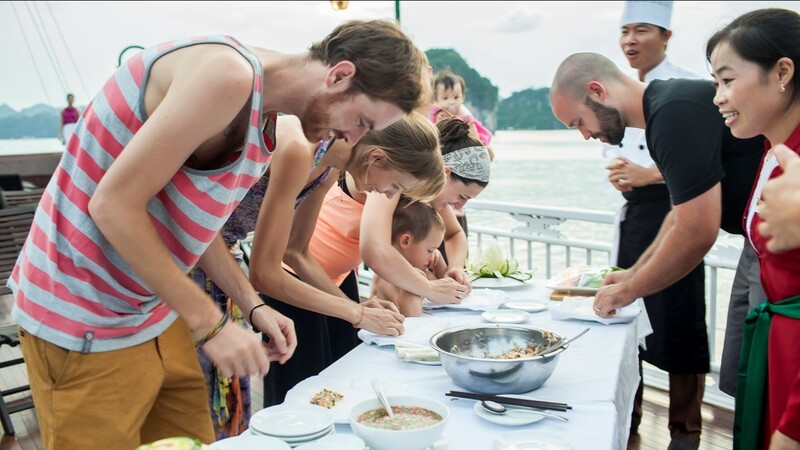 A trip to Vietnam with kids should just have the most memorable, educational and exciting experiences only. Arrive in Hanoi, check in your hotel and start with a cyclo tour to Hanoi Old Quarter. Enjoy the exciting and bustling atmosphere of Hanoi’s 36 Old Streets where traditions meet modernity. A welcome dinner will offer you just the best dishes of Vietnamese cuisine. A half-day city tour around Hanoi – the capital of Vietnam, landmarks including Ho Chi Minh Mausoleum, One Pillar Pagoda, Museum of Ethnology and Temple of Literature. In the afternoon, transfer to Bat Trang Ceramics Village to admire a Vietnamese handicraft of making pottery and ceramics. 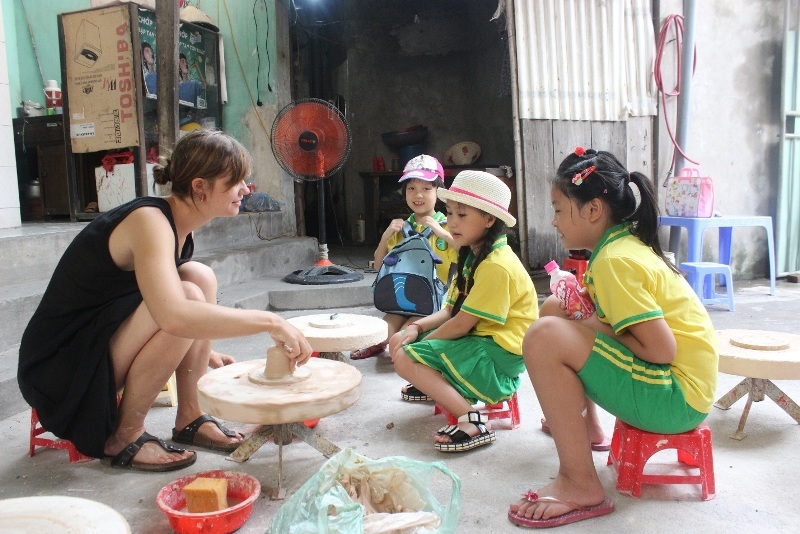 At Bat Trang, you and your kids can also try your talent with a wet clay and mould under the instructions of the craftsmen. Your family will have a great time having fun with the pottery and the kids will surely love this educational activity. 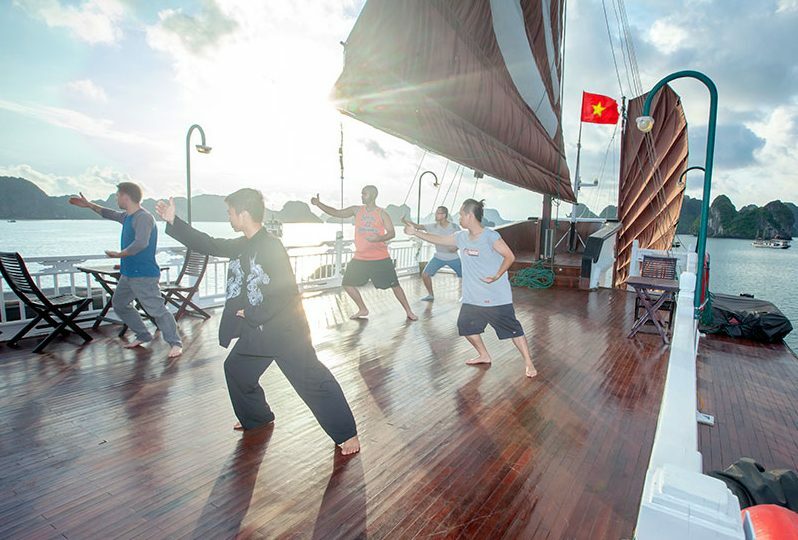 Enjoy exercising with a Tai Chi lesson on the sundeck while admiring the beauties of Halong Bay in the dawn of the day. Return to Hanoi and take a short walk to Sword Lake and Ngoc Son Temple. In the evening, book a water puppetry performance – a Vietnamese traditional folklore art. Night train to Lao Cai. Transfer to Sapa town – the most romantic highland town in northwest Vietnam. Trek to the most beautiful hill tribe villages such as Lao Chai & Ta Van, admire nature beauties at Silver waterfall and Heaven Gate. For adventurers, Vietnam is the ideal destination with a diverse kinds of landscape: mountains, hills, ocean, island, karst caves and deltas. North Vietnam is often praised for its unique natural and cultural features. For nature, it's the world heritage Halong Bay while for culture, Sapa and northwest Vietnam have most authentic indigenous hill tribal groups. Arrive in and stay overnight in Hanoi. Enjoy the nightlife of Vietnam's capital city. You should spend the first day to discover the capital of Vietnam where tradition meets modernity. Visit the impressive landmarks such as Ho Chi Minh’s Mausoleum, One-Pillar Pagoda in the morning. After lunch, prepare for a trip to Hanoi’s best sites: Hoa Lo Prison museum, Temple of Literature and a cyclo tour to Hanoi Old Quarter. At evening, watch a show of water puppetry – a unique Vietnamese traditional folklore art. Get to Halong Bay to leisurely cruise through the world’s wonder where the foot of grey limestone islands and islets are flooded with greenish water. If you have more time budget, it’s recommended that you should spend at least 2 days so you can stay overnight on the bay. On this day, you can enjoy a half-day tour in Halong starting with exercising with a Tai Chi Class on the sundeck while admiring the bay in the breaking moment of the day. Next, the tour will get you to Thien Canh Son Cave – one of the most beautiful caves in the region. In the afternoon, transferring back from Halong to Hanoi. In the evening, take the night train to Lao Cai Railway Station. This whole day should be spent to discover Sapa to your heart content. 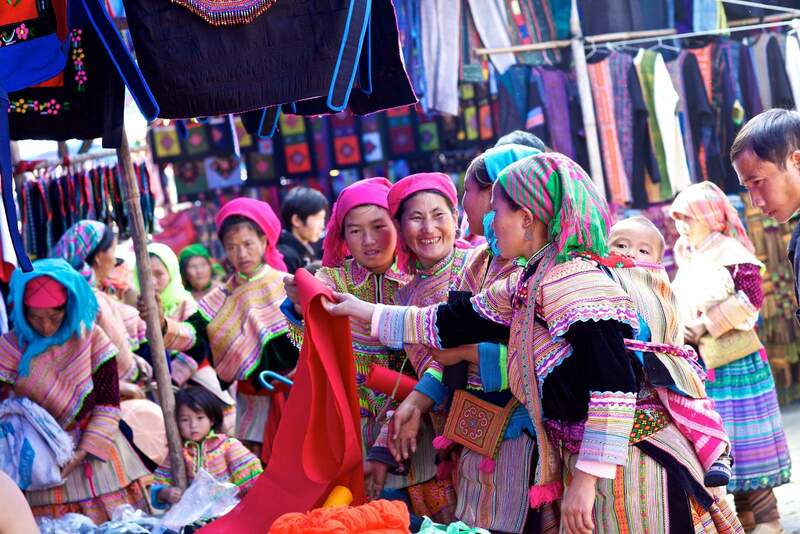 Muong Hoa valley is where you should head to if you want to soak up to the local ethnic cultural atmosphere. Ta Van Village of Dzay people is the number-one recommended site with an impressive rattan bridge. 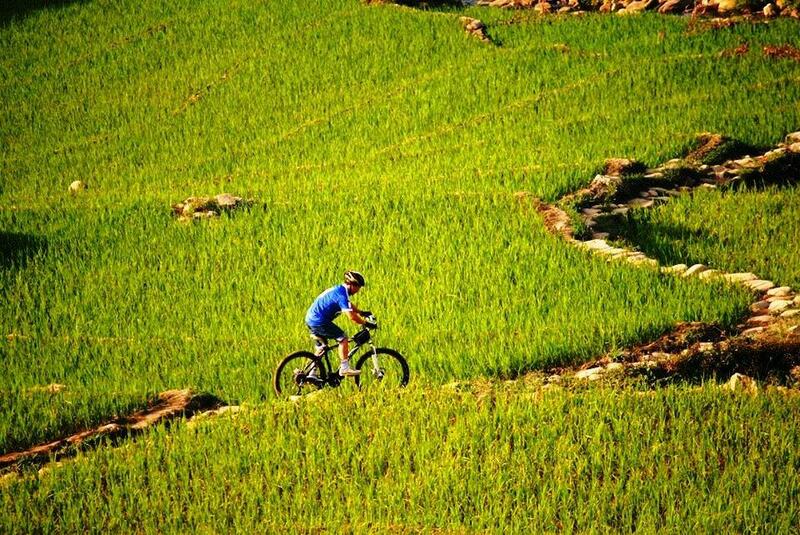 From Ta Van, you can also visit the neighboring villages to enjoy the majestic scenery of terraced rice fields. Start the day with the half-day village trek, your first destination is the famous Cat Cat Village which is located just 2km away from the town. 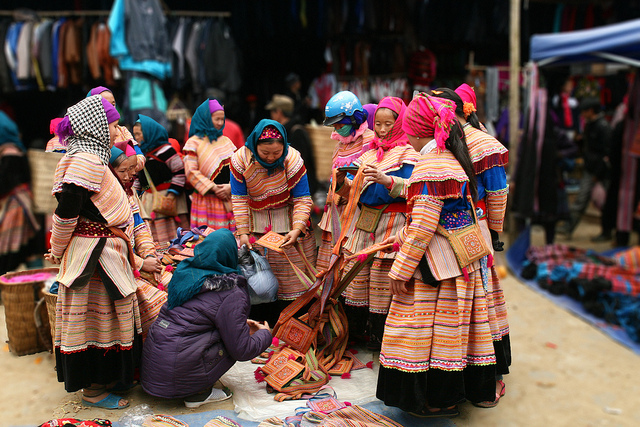 The walk through the village will give you a glimpse of ethnic Black H’mong’s traditional customs and practices. Don’t miss to visit Silver Waterfall – the most beautiful nature sightseeing in Sapa. Night train back to Hanoi. Discover the central line of Vietnam with the menu of Starter: Hue ancient capital, Main course: Swimming and Diving and finish with Dessert Hoi An Ancient town and My Son holy land. Stay overnight in Hue. Enjoy the nightlife scene in Hue, street foods if you're not too tired. 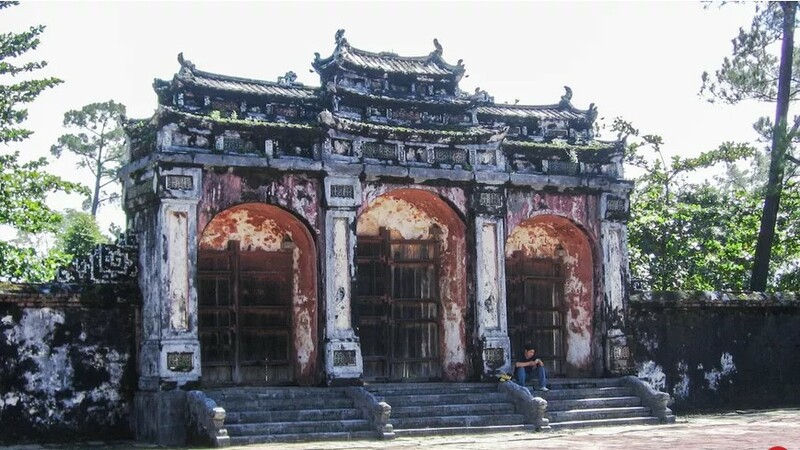 Hue, as one of Vietnamese earliest UNESCO world heritage, deserves to be discovered in a whole day thoroughly. The imperial capital of Vietnam is just so worth your visit – be it nature or culture. 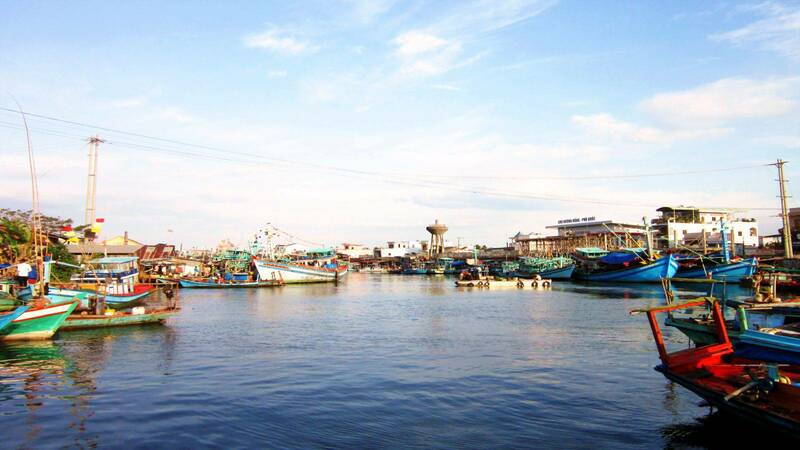 Your first destination should be Thuy Thanh village with its lively morning market. Nearby, you should come to take a look at 300-year-old Thanh Toan Tile-Roofed bridge and Farmhouse Exhibition where you will see the local working tool, meet and talk to the local people. Your next site is the highlighted destination of Hue – Forbidden Purple City which was built based on the Forbidden City in Beijing, China. The compound boasts an imposing beauty for its scale and architecture refinement. In the afternoon, you’ll get to see the tombs of Nguyen rulers of which Minh Mang Royal Tomb is the most representative example for architecture and nature harmonization. Thien Mu Pagoda is a site you shouldn’t miss in Hue. The most impressive part of the pagoda is its stupa facing towards the poetic Perfume River. Stay overnight in Hue and enjoy Hue nightlife. 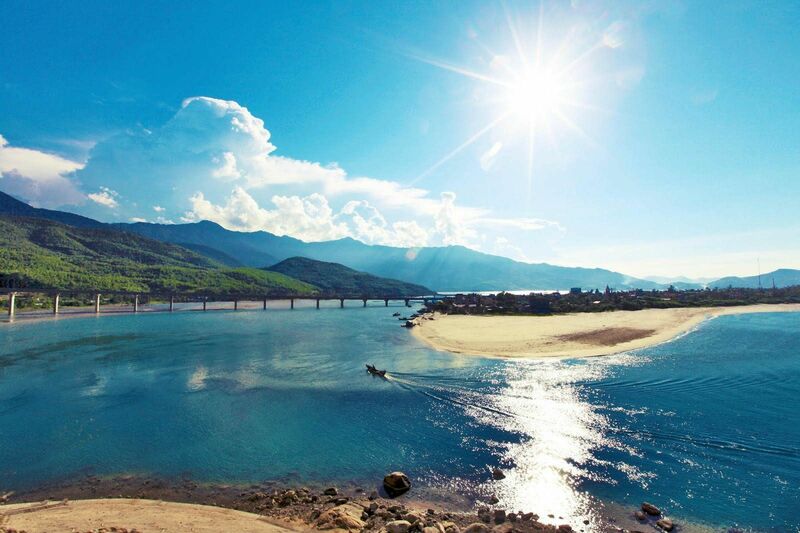 En Route from Hue to Da Nang, you’ll have the chance to witness the beauties of Lang Co Beach and Hai Van Pass. In Danang, you will visit Marble Mountains, Cham Sculpture Museum. Other sightseeings that are worth to visit in Da Nang: Ba Na Hills, Da Nang Asia Park, Ling Ung pagoda and Son Tra Peninsula, Marble Mountain. Stay overnight in Da Nang. 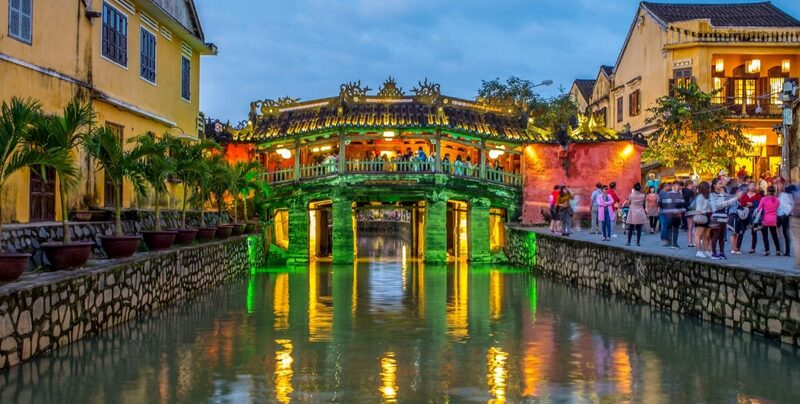 Hoi An is a UNESCO’s protected cultural world’s heritage. Explore its shop-lined streets, view the red-painted Japanese Covered Bridge – the three Chinese characters over the door mean “bridge for passers-by from afar” and tour the 200-year-old “Phung Hung” house, noted for its unique architecture. If you like more unique and cultural immersive experience, visit a workshop of a traditional lantern maker where you can meet the artisans and try your skills at creating your own lanterns. From Hoi An, you can easily visit My Son Holyland – another cultural world heritage of Central Vietnam. My Son was once a worshiping place of Champa Kingdom, boasting the quintessence of Champa and Hindu architecture. Their masterpieces mark a glorious time for the architecture and culture of the Cham, as well as of Southeast Asia. Get on board to sail to Cham Island – the most pristine island in Vietnam with primitive nature and beautiful landscape. Visit the Marine Protected Areas of Cham Island – a paradise for scuba-diving. Arrival at the first diving site, one discovery scuba dive with a certified PADI Instructor. (Average 30-45 minutes a dive at 6 to 12 meters depth, join group of 3 divers with 1 Instructor). Above are 5 best one week in Vietnam itineraries for 5 different groups of interest together with estimated costs and recommended tour. It's possible to get the most out of your Vietnam trip from North to South in just 7 days and still have something to look forward the next time you come back to the country. You find that the itineraries above don't match your references? Give us your requests here, or you can contact us to have our travel experts design a Vietnam tour just for you. Our comprehensive guide will show you from A to Z things to do in Sapa and how to make most of your Sapa experience.